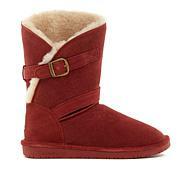 Wrap-around rawhide leather straps adds a bit of contrast to this cow suede boot. The short shaft features a side zipper to make tucking any pant easy. 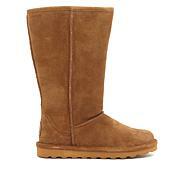 FIRST TIME BUYING BEARPAW. LOVE THESE SASSY BOOTS. WEAR 11 AND HAD TO EXCHANGE FOR SIZE 12. RECEIVED TONS OF COMPLIMENTS AND MY NIECE'S GIRLFRIENDS FROM AGE 17 -20 WENT MAD CRAZY OVER THESE BOOTS, AND NEVER HEARD OF BEARPAWS WEAR. BEARPAWS, YOU GAINED FIVE NEW FANS, INCLUDING ME. 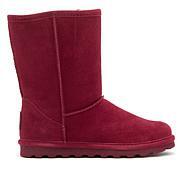 WOULD LIKE FOR BEARPAWS TO TRY OTHER COLORS SUCH AS (CELERY GREEN, SILVER, SEA GLASS BLUE, PINKS). WILL BUY AGAIN. I was waiting on another boot that I loved and than I decided to get this one. Love it!! I will be getting another pair in different style. I need fitting foot wear and these form to my feet. Ordered them in my size. These are to die for; comfy and neat. Thanks HSN! 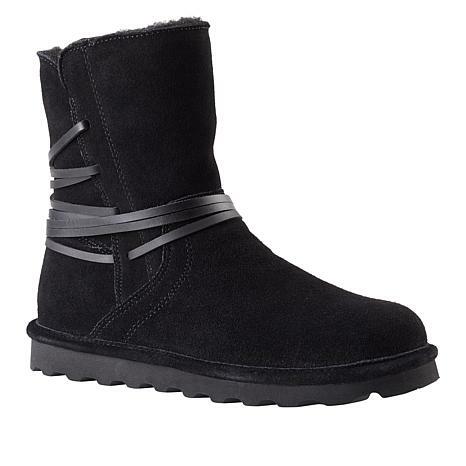 Ok, these are the perfect winter boot for me. The fit is true to size, love the fact that they can be worn in our rainy weather and that they look right in style for the season. They are soo comfortable and did I say, I Love them... I purchased them in black.